We've come a long way, baby. In the not too distant past, doing cutaways was a pain the neck. 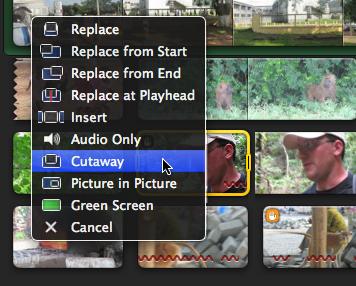 iMovie '09 makes cutaway audio so easy, you have three different ways to do it, each fitting different circumstances. The cutaway feature is the obvious choice really, but not perfect for every circumstance. This works great if you want clip B to remain permanently subordinate to clip A, but doesn't work great if you only want clip A to cover part of clip B. Plus, this is a pain if you want clip A's audio to cover clips B, C, D, etc. Just choose Cutaway from the menu, and your clip B sits on your clip A, casting its shadow and everything. Because we want to promote clip A, select the cutaway that is now clip B and either change its volume via the Inspector or just mute it entirely by pressing Shift-Command-M.
2. Use the Precision Editor. This works best if you want clip A's audio to cover just part of clip B. Add both clip A and clip B to your project, side-by-side. Double-click on the space between clip A and clip B. (Don't double-click on the transition, if you put one there. If there is a transition between A & B, double-click the space just above or below it.) This brings up the Precision Editor (Let's call it the PE for short). Now that you can see the sound for your clips, you can also change the cut point for the just the sound. To see what I mean, grab the part of the blue cut line that crosses the audio track of clip A. Drag it to the right and it snaps off the big blue line and drags independently. That little blue fragment of the bigger line will be the new cut point for the audio, covering as much of clip B as you want. 3. Extract a clip's audio. This way works best if you only want clip A's audio without the video or if you want the audio from clip A to extend over multiple clips. Clip A is still in the Event Browser. Just drag the selection from the Event Browser and drop it onto another clip. The Drag and Drop Menu appears, then just choose Audio Only. 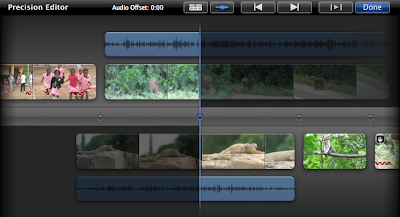 iMovie inserts just the clip's audio as a green audio banner in your project. Drag it wherever you want. Clip A is in your project. Select the clip and right-click (Control-click) on it. From the shortcut menu that appears, choose "Detach Audio". 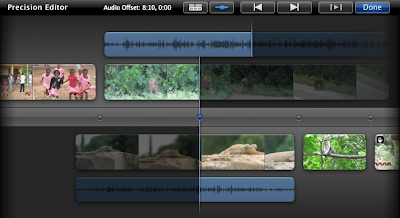 iMovie will split off the audio into a purple banner, and it also mutes clip A. (That way you aren't playing the audio twice.) Drag the purple banner wherever you want. It's a great thing when you go from one painful way of doing cutaway audio to three easy ways, each with their own strengths. If the trend continues, maybe someday we'll all have brain implants and editing iMovie projects will be done while we sleep. 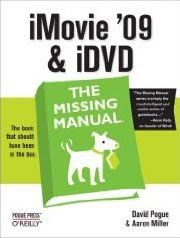 Maybe we can expect that in iMovie '63. Aaron: another great tutorial. 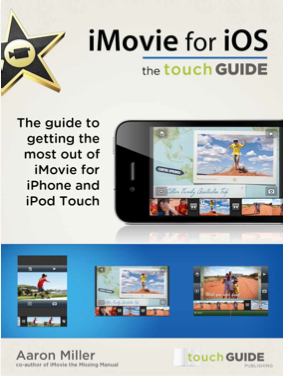 I've tried all of these and agree that they are all much easier in iMovie '09. When I use the "cutaway" advanced menu, I've run into one problem. When I go to drop clip B from the event browser onto clip A in my project, I have a hard time being very precise on the start of the cutaway. However, once I have created the cutaway, I can't seem to change its start frame. 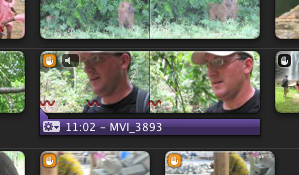 I can change the cutaway duration by editing clip B using orange single frame handles. I can delete clip B entirely and place it in again to change the start. But I can't seem to find a way of moving the start frame for the cutaway. Even the Precision Editor didn't help with this. Hi, Brad. I think you need the clip trimmer. You can access it by clicking the gear icon in the cutaway clip itself, or by pressing Command-R while the cutaway clip is highlighted. This window allows you to change the start and end points of pretty much any video clip you select. It shows your source clip and highlights the part that has been selected for your movie. You can slide the selection area around on your source clip by grabbing anything inside the yellow borders and dragging around. That will change the start frame of your cutaway. I'm not being clear. I don't want to change the start/stop frames of cutaway clip B. Clip B's duration and start/stop are ok.
Rather, I want to change the starting frame in clip A where/when the cutaway happens. Typically I've dropped the cutaway clip B onto clip A a few frames too early or two late. For example, I want to do the cutaway right at the time that a person mentions seeing something. But I might have dropped the cutaway on clip A 10 frames too soon. I haven't been able to get the clip trimmer or the precision editor to reposition the location of cutaway B inside of clip A once I've dropped it. If this still doesn't help, I guess I could try and make a screencast or something. ive been working on a project and have been adding several cutaway clips. i chose to mute all my cutaway clips. all of a sudden, the cutaway clips original sound plays. even when i drop the audio, it still plays. please help? Thank you sooo much! I had been struggling for hours! HELP i can not delete the audio from my cutaway, I detached the audio and it's still there. I attempted to manually reduce the sound, it's still there? What can I do? I'll never understand why iMovie does not work with the concept of a TIMELINE like any foolproof editing software does!!??? A timeline and the proper tools would take all the hassle away with edit and trimming A/V Separately. Who invented this "zig-zag" filmstrip editing behaviour anyway? My name is Aaron. I'm just a guy who uses iMovie and decided to share how I have learned to use it. If you have questions or suggestions, feel free to email me. I did ads on the last blog, and decided I didn't like them too much. If you think anything here is worth a tip, feel free to click the link below. Whatever you do, thanks for reading. Now go make some cool stuff in iMovie!